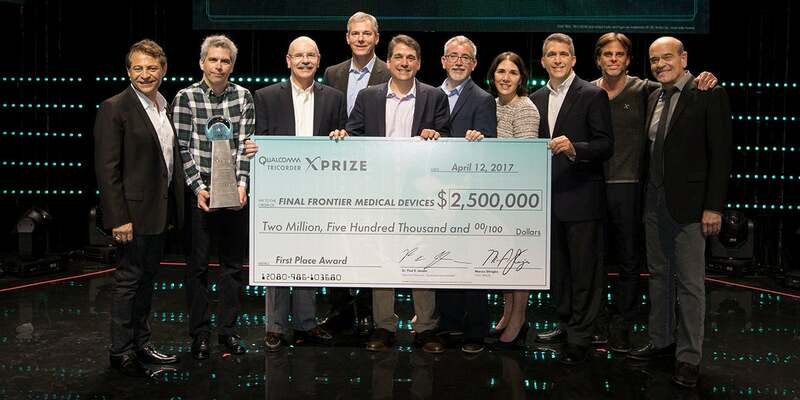 The Qualcomm Tricorder XPRIZE was a $10 million global competition to incentivize the development of innovative technologies capable of accurately diagnosing a set of 13 medical conditions independent of a healthcare professional or facility, ability to continuously measure 5 vital signs, and have a positive consumer experience. Very few methods exist for consumers to receive direct medical care without seeing a healthcare professional at a clinic or hospital, creating an access bottleneck. In virtually every industry, end consumer needs drive advances and improvements. Except in healthcare. Very few methods exist for consumers to receive direct medical care without seeing a healthcare professional at a clinic or hospital, creating an access bottleneck. Despite substantial investment to improve the status quo, even average levels of service, efficiency, affordability, accessibility, and satisfaction remain out of reach for many whom the system was intended to help. • Each team has continued to advance innovative devices through clinical testing in the United States, Canada, India, and China. • Cloud DX is commercializing their Vitaliti Continuous Vital Sign Monitor, a key part of their competition entry. Testing for regulatory approval is underway, with final approvals expected in 2019. • Qualcomm Foundation has committed $5.3M in post-prize programs, primarily funding clinical testing at The Altman Clinical and Translational Research Institute (ACTRI) were the devices were tested throughout the competition as well as the development of IT infrastructure to support device data transfer and storage into a cloud environment. • The Roddenberry Foundation has committed $1.6M to fund a combined effort in Mozambique and the Qualcomm Institute at UCSD. The program will put innovative technologies into the hands of healthcare providers to more rapidly and accurately diagnose Tuberculosis (TB) and hypertension—two significant unmet medical needs throughout Africa.